I love this little girl. Her rosy cheeks are kissable. and I still put my jumper on my head like that !! I have only just stumbled across your site as am researching going to Nepal to do an art project. You have totally inspired and spurred me into action! those are some rosy cheeks! Your work is really great, u know how to capture people with great portraits, everyone of them tells an story, and your landscapes are just great, amaizing spots for photography. you should try to do a reportage to National geographic, your in that level. ;) please come to peru and take great shoots, i would love to see my country portrait by your camera. (ummm you can climb ausangate, salkantay and specially huascaran). You can see her story in her eyes. (HK)Thanks Latarsha, though please do not post any spammy URL’s as they will be removed. Tibetan kids are just so lovely. I like the emotions that you have captured here. Sometimes I wonder if the little ones have these rashy chics because of the intensity of the sunlight (I assume that where they live is high in elevation) or lack of vitamins. I saw the same thing in in Machu Pichu. Maybe next times I will bring some extra SPF15 for them. Love your site and I don\'t even remember how I stumbled upon it (Hey they should make that a website!) :) I am tweeting and facebook linking lots of your work. As for this little one, she reminds me of my daughter (adopted from China) when she was that age, but the dry skin on this little one\'s cheeks breaks my heart. I can only imagine what the Tibetan climate is doing to her sensitive skin. Lovely composition and texture captured. I wish there was some more key-light in the eyes. 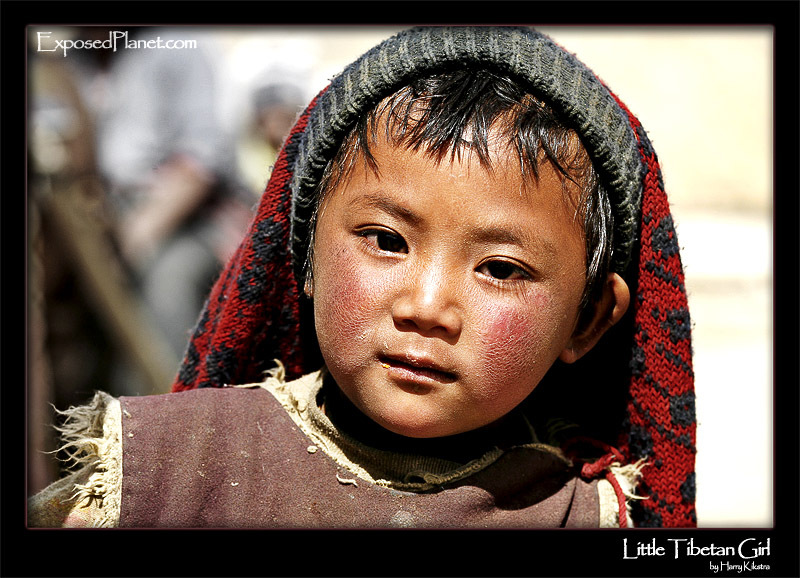 The story behind "Tibetan girl with sweater"
Happy new year everybody! May you all have a wondrous 2008, filled with joy. This is the same little girl as is portrayed with her little friend on one of the most popular images on the site (see the ‘Archive’ button on top of the page). Hope she inspires you to look at the world with new eyes in 2008. Performancing.com and you can nominate me for best PhotoBlog. here (photo) before January 11, thanks!